After years of testing, and trials in various cities around the world, the U.S., the U.K., and other counties are rolling out 5G. AT&T, Verizon, and BT announced at Qualcomm’s Tech Forum currently going on in Hawaii that they have turned on 5G in cities all over the world, including hurricane devastated Panama City where the infrastructure was severely damaged. Motorola announced they are shipping 5G phones, and Samsung showed prototypes that will be available in 2019. The bandwidth will be 1GHz in most situations—that’s over a 50 MB file downloaded in less than a second. Qualcomm brought together global mobile operators AT&T, EE, Telstra, and Verizon; global infrastructure provider Ericsson; global network infrastructure and mobile device makers Samsung; Motorola, Netgear, and Inseego, to introduce the first commercial 5G mobile platforms, based on the Snapdragon 855. 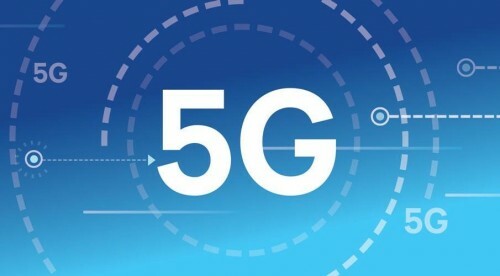 The companies showcased live 5G networks and mobile devices with multi-gigabit connectivity powered by 5G, 4G LTE and Wi-Fi– a truly end-to-end experience featuring devices, experiences, and networks. The MotoZ3 is on sale now ($480 Verizon) and the 5G modem in it gets turned on in the first half of 2019. It has a 6-inch OLED HD screen, a 3k mAh battery, and dual depth-sensing cameras (12 mPix each), and it uses the new Snapdragon855. These achievements are the result of Qualcomm investments and inventions over decades, which has gotten us to 3G, 4G and now 5G by driving an end-to-end system approach. Qualcomm has invested in R&D and the commercialization through first prototypes, demos, trials, chipsets, and mobile platforms. At the Tech Forum, Cristiano Amon, Qualcomm’s president discussed the progress and leadership Qualcomm has shown on the path to commercialization of 5G. 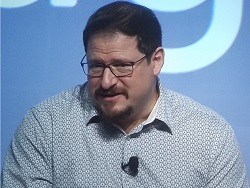 He believes 5G will be a commercial reality starting in early 2019 with mobile device launches and network rollouts across North America, Europe, Japan, South Korea, Australia, and China. 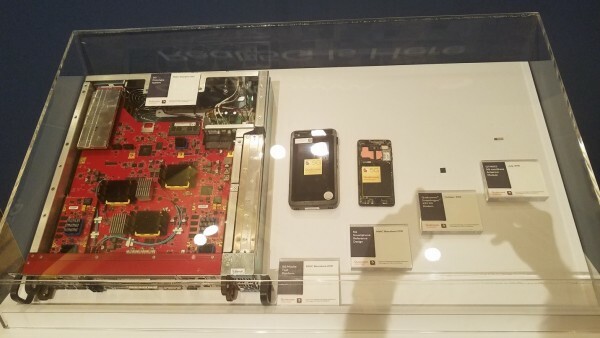 Amon also reviewed how Qualcomm Technologies is uniquely positioned to propel 5G deployments with the Snapdragon 855 mobile platform, the Snapdragon X50 5G modem family and Qualcomm QTM052 mmWave antenna modules with integrated RF transceiver, RF front-end, and antenna elements. If Qualcomm has any secret sauce, the antennas and beam-forming are a big part of it. mmWave are the 24 GHz or higher signals that 5G uses, as compared to the 600 MHz – 5,8 GHz used today for 4G. Qualcomm has spent the last couple of years proving the concepts and shrinking the antenna assembly, as illustrated in the following picture of their efforts. The big red circuit board is the porotype the company showed in Shanghai in 2017. To its right are the two they showed at MWC Barcelona 2018. The little square chip was shown in October 2018, and the final version is shown above. 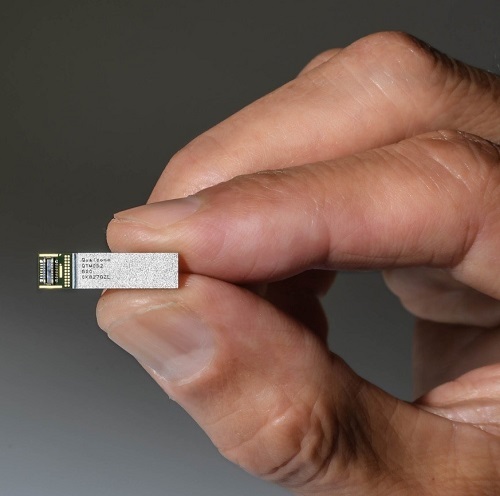 Qualcomm’s QT052 mmWave antenna module. Amon commented on the some of the skepticism about 5G and said it reminded him of when people said CDMA would never work. But work it does. Anyone who has studied physics, radio, or electronics knows the inverse-square law that the higher the frequency the shorter the distance a radio wave can travel and the more easily it can be attenuated by obstacles. Qualcomm tested that theory and ran it through the rain, through foliage, bounced it around buildings, and sent it through a window and then a wall and in all cases not only got a signal but the worst cast attenuation brought the bandwidth down to 0.8 GHz. Part of the trick is to use beamforming where multiple signals are sent simultaneously and the receiver picks out the strongest ones. The tiny antennas shown above are placed around the edge of the case of the phone. 5G is here, and we are witnessing a revolution in personal communications. And it will extend to industry too for IoT, autonomous vehicles, portable diagnostic instruments and all sorts of things we haven’t imagined yet—it will be a new enabler just as the Internet was. I can’t wait.